I spent this past week on a mediation retreat, joining other alumni rabbis and cantors from around the country who have participated in a 2-year cohort of the Institute for Jewish Spirituality, which I did several years ago. Silence is formative for me, allowing the mind to settle, the heart to open, the sense of a larger understanding of myself, existence and God to unfold. We were studying texts about Abraham, how he was both a man of deep chesed, of loving kindness and compassion, and a man with a sharp sense of justice and righteousness, which he displayed throughout his journey. He became the father, along with Sarah the mother, of Jewish people, and many of peoples, inspiring a legacy that is now thousands of years old. I am thinking about Abraham from my retreat, but the Torah now is about Moses, a successor to Abraham who went on his own spiritual journey. And I am thinking about Martin Luther King, whose birthday we observe today. Dr. Martin Luther King, Jr., a man who, through his leadership ability, was able to unify his people, stand up in the face of injustice and bring about the most radical change in social policy that our country witnessed in the 20th century. What was it that allowed Dr. King to achieve greatness? Was it his brilliant oratory skills alone? Was it his vision of a different America, one with equality and freedom for all? Was it the time in history alone? I believe that all three of these, and so much more, contributed to the success that Dr. King’s vision eventually was able to realize. However, more than any of these, I see Martin Luther King as a leader mainly because he was able to move his people from seeing and believing his great vision, to acting, responding, and persevering in the face of violent opposition. In this way, Martin Luther King was like Moses. It is also no coincidence that Dr. King couched his historical vision in the story of the Exodus, comparing his people’s plight to that of the Israelites in Egypt. These past few weeks, we have met Moses, our new leader and advisor. The stories of Abraham and Genesis are over; the reality of slavery and nation building will now be our focus for the remainder of the Torah. Moses is commanded to go to Egypt, gather the people and demand their freedom from Pharaoh. As Moses and Aaron enter scene, I imagine the people’s energy bubbling, as they sense that their moment of redemption is perhaps upon them. A few weeks ago, we read, “And Moses and Aaron went and gathered the elders of the children of Israel. And Aaron told them all of the things that God had said to Moses; and he performed the signs in the eyes of the people. And the nation believed; for they heard that God was remembering them because God saw their plight, and they were humbled and they bowed low.” (Ex. 4:29-31) This is an extraordinary moment in time, one that is about to herald a new era in the lives of these slaves. Nehama Leibowitz, the great modern Torah scholar, calls this “the spiritual height” of the people; they were imbued with “historic awareness.” The language of the verse is so poignant: the nation believed — va’y’amen ha’am. Two unique words appearing side by side — va’y’amen — from the root amen, to affirm, witness, believe in; and ha’am — the nation — no longer a band of brothers, a group of children, a single family unit. On this day, the nation of Israel is born, as they realize, according to Ibn Ezra, that the “end of the [slavery] spoken to Abraham” is occurring. The momentary nation of Israel recedes into the background as the taskmasters, failing to convince Pharaoh to annul the decree, approach Moses and Aaron, crying out, “May the Lord look upon you and punish you for making us loathsome to Pharaoh and his courtiers-putting a sword in their hands to slay us.” (Ex. 5:21) What happened? Where did the faith disappear to? This is a pattern that will continue throughout the life and time of the dor ha’midbar, the generation of the desert, as they come to be known in rabbinic literature, including before crossing the sea last week, and after receiving the Torah and God’s revelation this week. Faith and certainty fall into fear and rebellion. It is precisely this pattern that I see as the ultimate problem facing the Israelites in the attempt to free themselves. The words of inspiration, the signs and wonders performed, the quick fix-these rally the people and bring them together. However, the moment that anything goes wrong, or they face a difficult challenge, the people give up and begin to whine. It is very easy to be persuaded by fanciful language, a powerful message, and an easy answer. However, the challenge of true leadership is the ability to guide people through the difficult, dangerous, painful, and sometimes-fatal situations that stand in the way of achieving a moral or spiritual victory. Moses is new at this kind of leadership, and so he, in turn, runs to God at the beginning and cries out, “Lord, why have you brought harm to your people? Why did you send me? Ever since I came to Pharaoh and spoke in Your name, he has dealt worse with this people; and still you have not delivered Your people.” Moses is also afraid, thinking that this was going to be an easy task. However, God reminds Moses that this will take time and determination. There are no easy roads to redemption. Moses develops into a brilliant leader precisely because he is able to stand with his people, feel their pain, and eventually lead them to freedom with a consistent and steady hand. Yet, Moses might have done well to warn the people that this was not going to be easy, that no matter what Pharaoh did to them, they must stand their ground and see the larger goal at hand. As we celebrate the life of Martin Luther King, this year he would have been 85, I have been wondering what he might say about the world today. Dr. King never cowered in the face of injustice, never bowed to pressure or intimidation. He spoke his mind from his particular religious, ethical and moral perspective. And so I wonder aloud: What would he say about the large number of children living in poverty, without access to healthcare and education, let alone clean drinking water and adequate, if any, amounts of food? I wonder what Martin Luther King would say to the leaders of our nation as they continue to rob the poor to pamper the rich, irresponsibly cutting social service programs, bickering over how to spend our tax dollars, often so that the elite strata of our nation can grow their bank accounts? I wonder what he would say to the Israelis and Palestinians, who continue to refuse peace proposals, opting for war rather than take the path of peace and nonviolence? Certainly the Palestinians could use a leader like Dr. King to inspire their people to protest injustice in more nonviolent, humane and effective ways. On the heals of Tu B’shvat, what would King say about extreme weather and our woeful blindness to the peril of our planet? Education, living wage, workers rights, equality? What would he say, but more importantly, what would he do? I believe that Dr. King would be in the streets, standing with the poor and hungry, with the striking workers fighting for a decent wage, and speaking out for justice, righteousness and peace. Dr. King was a leader that was not afraid to stand up in the face of injustice, and in the end he paid for it with his life. Like Abraham, he was a spiritual leader, like Moses, he was a revolutionary. Yet, how many of us have been inspired by his, or other great leaders words, promised to get involved in one thing or another, and then failed to follow through? Pirke Avot teaches, “It is not up to us to finish the job, but neither are we free from trying.” The Israelites saw the light, but the moment Pharaoh’s finger covered the hole, and darkness came back, they gave up, ran away, blamed their leader. So too with Martin Luther King-each time that his people were beaten, tortured, killed, some of them came to him and said, “This is wrong. Things are not so bad as they are, you must stop this challenge to society.” Yet, King stayed the course, directed his people not to fear in the face of the modern Pharaoh. In commenting on the situation of civil rights, Rabbi Abraham Joshua Heschel once said, “At the first conference on religion and race, the main participants were Pharaoh and Moses… The outcome of that summit meeting has not come to an end. Pharaoh is not ready to capitulate. The exodus began, but it is far from having been completed. In fact, it was easier for the children of Israel to cross the Red Sea than for a black person to cross certain university campuses.” The lesson from the Torah these weeks is one that applies to all people fighting for freedom, struggling to make change in the world, or simply wanting to live with an active moral compass. Believing in change is easy. Making change happen is not. We all must have the willingness to be inspired, and the courage to turn that inspiration into reality. This is the message of Martin Luther King; this is the message of Abraham; this is the message of Moses; and this is the message of God. 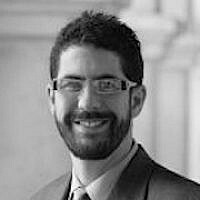 Rabbi Joshua Levine Grater has been the spiritual leader of the Pasadena Jewish Temple and Center in Pasadena, California since 2003. He is an executive committee member of the Board of Directors for T’ruah: The Rabbinic Call for Human Rights, co-founder and co-chair of AFPI, Abrahamic Faiths Peacemaking Initiative and is co-chair of J-Street's Los Angeles Rabbinic Cabinet.